This week we begin adding muscle to out basic shapes. This is where using these basic shapes, as opposed to the tradtional ones, really pays off. Because the NH basic shapes are based on real anatomical relationships, you can hang real anatomy on them, or use them to check anatomy that looks wonky. This first week I'll focus on what is both the most important and probably the most mis-drawn and poorly understood region of the body, the torso. Understand please that I am NOT seeking to convey a complete or entirely accurate lesson in anatomy here. I'm just teaching you the biggest muscles that are visible in almost every body type. I don't have a physician's knowledge of anatomy. But using the proportionally scalable basic shapes I've shown you so far, I can now give you a guide for hanging fairly accurate anatomy on just about any body you'd care to draw, in a way that can be useful to cartoonists working representationally or very cartoony alike. 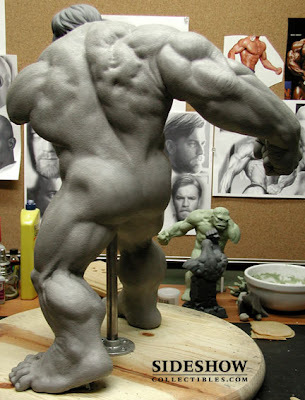 The back has many layers of muscle, and I've leaving a lot out in favor of showing the most visually prominent ones that have the most effect on surface features. 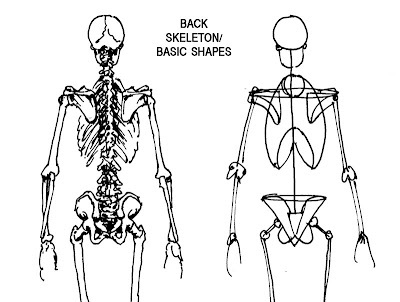 Closest to the bone are two powerful columns of muscle that run up either side of the spine and form the dip in the center of your back, and in some can be seen through the skin of the lower back, disappearing as they head to their root on the tailbone. Another muscle everyone has probably seen but which many mistake for fat is the lowest and largest of the external obliques, along with the internal oblique. These form a wide ridge that rides along the top of the pelvic bowl. Even very skinny people have these in some capacity, and any torso drawn without them looks wonky in a way that's often hard to put one's finger on if they don't know what's missing. The external obliques wrap around your sides and eventually meet up with your abdominal muscles on the other side. Unless you're drawing someone VERY ripped you don't need to concern yourself much with them. In someone like me they seem to form a uniform sleeve of muscle around the sides of my torso. 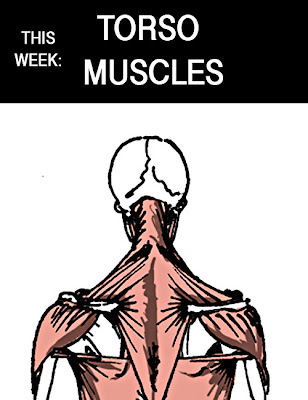 Covering most of the back is the largest and probably most visually important muscle of the entire back, the latissimus dorsi. If you've ever seen a body builder, it's the muscle that makes them look like they have webbed arms and gives them their triangle shape. It's insertion into your humerus forms the back of your armpit. You can draw it easily by drawing two lines swooping up from the middle of the pelvic ridges and then wrapping tightly across the ribs (so much so that on many people, myself included, the ribs can be seen through the muscle) and then reaching out to connect high on the humerus. The top edge should be placed so that is actually covers the bottoms of the shoulder blades. Look closely and you'll see that the latissimus dorsi actually twists as it inserts into the humerus. This gives it a little extra leverage for the many motions is performs or helps perform. 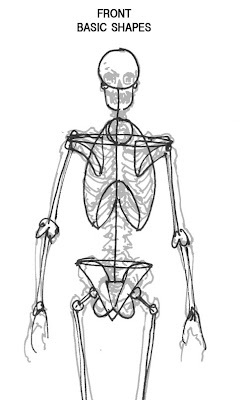 Note the HUGE diamond-shaped sheath of connective tissue over much of the muscle that connects it to the pelvis. To draw this feature, simply draw two curves starting from halfway in between the pelvis and ribs up to the top of the latissimus. You'll need this feature if you're going to be drawing back muscles in any detail, as this feature if prominent in surface anatomy. Next comes the trapezius muscle and the back two lobes of the deltoids, which shape your neck and shoulders in the back almost entirely. You can see how when you add these the skeleton stops looking like a skeleton and more like a body with the flesh stripped off the limbs. These both look complex, but they're both stupidly easy to draw with the basic shapes. 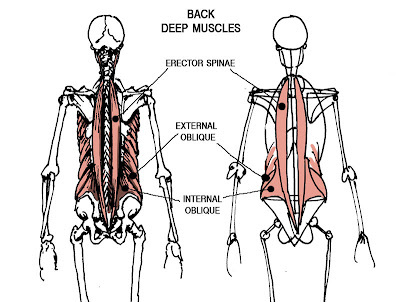 For the trapezius, start with a did in the center of the back right where the dip of the ribs meets the spine. Draw two straight lines from there up to the top inside corners of the shoulder blades. Now the muscle spreads out and covers the entire top edge of the shoulder blades, and part of it curls forward to tug on the outside third of the collar bone, which you can't see. From the shoulders it sweeps up to the bottom of the back of the head, forming the entire back surface of your neck. It's a lot like a cowl that's been trimmed. To draw the back part of the deltoid, take the bottom of the top side of the shoulder blade, and from one end draw the muscle going out over the shoulder joint and down the humerus, inserting a little over half way down, and from the other side draw a diagonal curve to meet it. No matter how much muscle you have, the collar bone and the top edge of the shoulder blade will always be near the skin, and if you flex those muscles or if you raise your arms the muscles form a valley as they swell up around the bones. Here's how many of these muscles may look as seen through the skin, depending on many factors sch as fitness and weight. 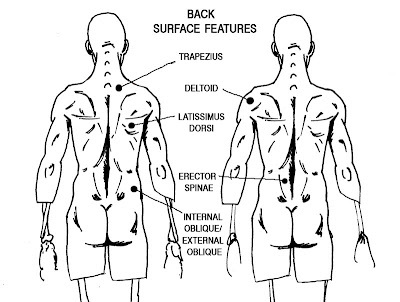 On some people you can see the top edge of the latissimus dorsi as it crosses the shoulder blades, and on some people there may even me a little muffin-top swelling of shoulder muscle squeezing out over it. The diamond of the trapezius is often visible. The place where the fascia sheath of the latissimus begins may form two swooping edges that may be mistaken for the bottom of the ribs, or if you've very skinny they may in fact be the bottoms of the ribs. 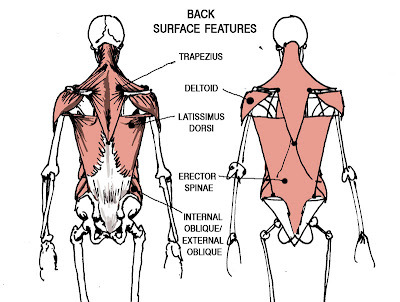 You can also see where latissimus reaches under the arm to form the back of the armpit and gives shape to the back. You can see the erector spinae as they form two distinctive columns of muscle. You can also see the two dimples where part of the pelvic ridge meets the skin. And you can see where the external oblique muscles (which is also often capped with some fat) forms the wide and thin parts of the waist. In a pinup girl, the thin point on top of the muscle would be the center of her hourglass figure. 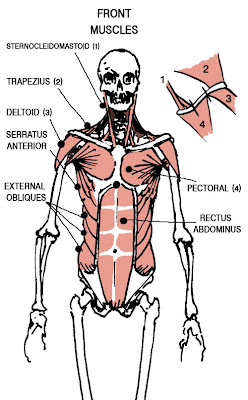 Here's those muscles all labeled out and exposed so you can compare with above. The important , visually dominant muscles of the front aren't terribly complex and are very easy to draw. To start, think of the collar bone as divided into thirds. Lots of different muscles pull on the collar bone and this will let you sort them out. On the back inside third of the collar bones you have the sternocleidomastoid (1) muscles, which reach up from there to just below your ears on your skull. They're probably the most prominent feature of any human neck and BOY does it look strange when they're drawn wrong, as they so often are. Don't just throw lines on the neck every which way- if you don't know where a line is coming from and going to, learn it or don't use it. The outside back third of the collarbone is pulled on by the trapezius (2), which reaches over your shoulder to get to it. The front outside third of the collar bone is pulled on by the front of the deltoid muscle, which you draw, of course, by having it go meet up with the others on the humerus. The last muscle pulling on the collar bone is the pectoral (4), and this is where it gets cool: The top part of the pectoral pulls on the center and middle thirds of the front of the collar bone. From there, it goes down the ribcage to just above the top of the arch in the front of your ribcage. Then it turns around again and attaches to the ribs about as far out as it went before. That was all lust one end of the muscle- then the muscle tapers to a point and attaches to the humerus. 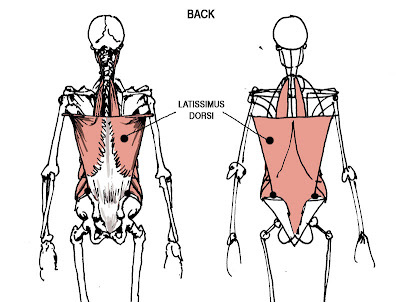 As you can see, just like the latissimus dorsi it twists before it inserts, and in very ripped people this twist is so prominent it looks painful. 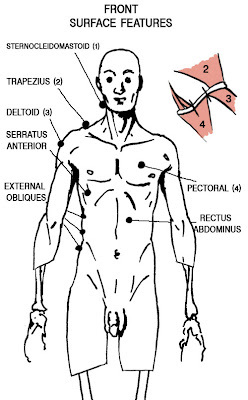 The insertion of the pectoral into the humerus forms the front of your armpit. Now we have a complete armpit! It's sort of misleading when people refer to abs because what they usually mean is actually one huge, long muscle that's squished into eight bulgy segments by connective tissue. It starts right at the base of the ribcage and it goes all the way down th the pubic ridge of the pelvis. Drawing two straight lines down is enough to draw most people's, but just so people don't start gong all Rob Liefeld and giving their characters 20 or 30 abdominal bulges, there are EIGHT in total, two long ones below the belly button and six above. If you draw a character with 12 because "He's an alien, man", I will beat you about the face and neck with a lead-filled shillelagh. The external obliques (remember them?) all attach the the sides of the rectus abdominus muscle with connective tissue. 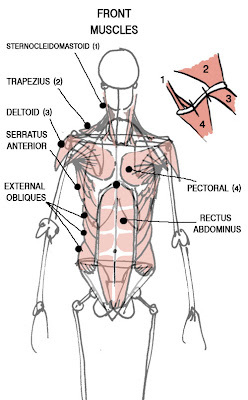 Just under the pectorals and actually interweaving with the external obliques are the serratus anterior muscles, with spread like fingers out the backs of the shoulder blades and wrap around your side under the arm. In very well developed people they are visible. I actually don't know much about drawing them, but if you have to draw them in detail you REALLY should look them up and find out how they actually are. I'm just warning you, they're there. Here's the muscles of the front with the basic shapes visible. You hang stuff off them jst like you would bone. Great for working out a pose or checking one that seems wonky. The erector spinae and the bottom of the latissimus are both protruding in his lower back, and you can follow the line of the latissimus right up under his arm. His trapezius is active, forming two mountain ranges up both sides of his upper spine and up to his neck. You can see the deep valleys formed by the tops of his shoulder blades where, even on him, the bone comes to the surface. And you can see the external obliques over his pelvis on either side. 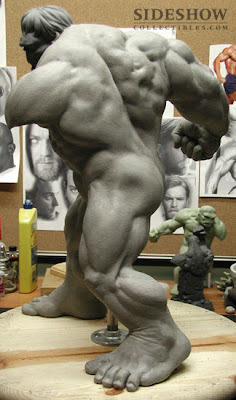 From this angle we can see latissimus forming the back of Hulk's left armpit. Trapezius and deltoids are both clear and bulging, and the lower external oblique can be seen peeking out of the shadow under the wing of latissimus. From the front the twist of the pectoral as it inserts is clear as day, and looking at the front edge of his collar bone you can see that it really is divided into thirds and shared by deltoid and pectoralis. On the back of the collar bone you can see trapezius reaching forward to pull on the outer third. 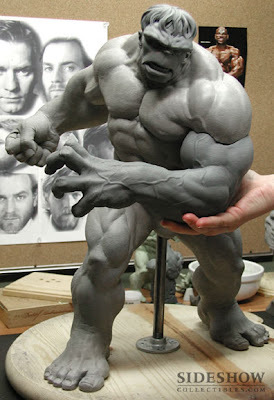 Make your figures as skinny or ripped as you like, as realistic or cartoony as you like, the muscles will still be in the same relative places. wow mr. bernier. you are the master! if you had your own anatomy book i would totally buy it. i just have those idealized burne hogarth books which are pretty good but i would love one that's more realistic. Since this is a multi-part series I think people are waiting till I'm done to comment and ask stuff, for the most part. I mean, when I posted about white out consistency the thread went like 20 deep. Actually I practice this and you should know about this even if you draw, because you can make impossible positions that would not make any sense.